Charlie (C) – My name is Charlie Guest, I am 19 years old and am a member of the British FIS/Europa Cup Alpine Ski Team. I compete in all disciplines across Alpine Skiing (Slalom, Giant Slalom, Super-G and Downhill). I am currently skiing with HEAD and a full time athlete. 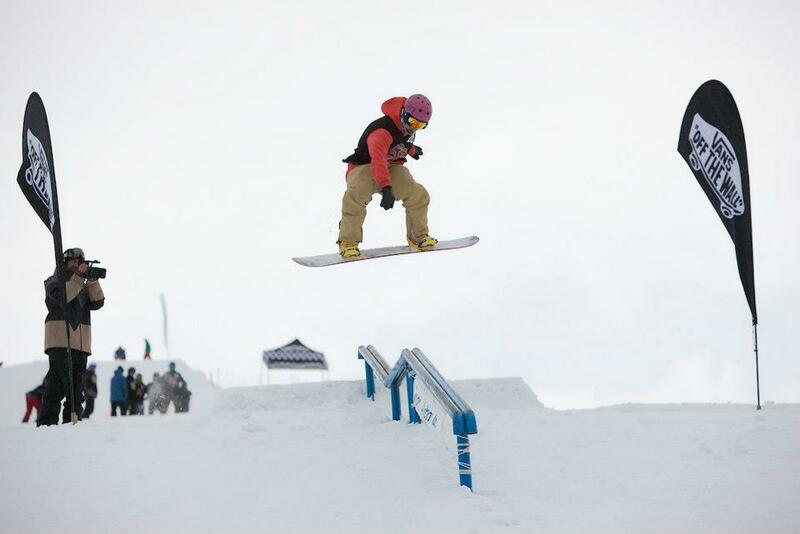 Jamie (J) – I’m Jamie Trinder and I’m a 19-year-old snowboarder from Boat of Garten. I studied for six years at Grantown Grammar School and I am now working hard to pursue a career in snowboarding as a member of the GB Freestyle Snowboard Team. How did you start in the sport? J – I began on skis at the age of four and then switched to snowboarding when I was eight. My brother and I got our first snowboards for Christmas and we picked it up quickly once we got sliding on CairnGorm. I had my first proper snowboard lessons through the schools snowsports programme on CairnGorm. Later I joined the Cairngorm Snowboard Club when I became interested in freestyle and got involved in my first competitions. C – My father used to race when he was a teenager with SSC up at CairnGorm, so there has always been an interest in ski racing in the family. I got my first taste of skiing at the age of 3 on the golf course in Nethy Bridge, and by the age of 6 was finally allowed to ski at CairnGorm. From there, everything seems to have happened very quickly and I joined the SSC Race Training group on weekends, and in 2007 was selected for the British Childrens’ Ski Team. Where are you now with in the sport or industry? J – I am about to start my second season as a member of the GB Freestyle Snowboard Team – I am very grateful to be a part of the team and I’m stoked to be able to ride and train with some of the best snowboarders in Europe. Being in the team gives me access to amazing coaching, physio and strength and conditioning support all of which has helped my progress. As well as the British Championships and other UK competitions I have competed twice in the World Junior Snowboarding Championships and I have been given a Silver Passport by the British Olympic Association as a development rider in slopestyle for the 2018 Winter Olympics. C – I am racing as part of the British FIS/Europa Cup Ski Team and made my world cup debut in Flachau in Austria last January. Over the summer I have been training and racing down in New Zealand, and am incredibly excited for the Northern Hemisphere winter to start in just over a month. Whilst in New Zealand, I won the ANC GS title, which will give me bib 31 in all the Europa Cup GS Races this season – something that will be of a huge advantage to me. I am currently ranked 1st in Britain for slalom overall, 2nd in Super-G and 3rd in GS. My main goals for the coming season are to make it into the top 5 at the World Junior Championships in February, and to make my first Europa Cup points. What special memories do you have of training in the Cairngorms or riding in the Cairngorms? C- There are so many that I have from training in the Cairngorms. I think my favourite has to be when we were first introduced to slalom gates at my first ever Children’s race at the Cairngorm Ski Club Championships. I had no idea what do so, I just picked my way down the course. Obviously I went the wrong way around almost every single gate, but that didn’t seem to stop me at the time, naturally I couldn’t understand why I had been disqualified until I watched all the older girls come down afterwards! J- Living in the Cairngorms National Park, my home resort is CairnGorm Mountain. I have many special memories of riding on the hill but nothing beats that first run of the season after a long summer waiting for the snow to return. Cruising around with my friends after a big storm riding the natural terrain of the mountain is awesome. After training abroad I always feel stoked to come home and get back to riding CairnGorm. What has been the highlight of being involved in the sport? C- Skiing is such a unique sport that you just feel so lucky to be part of it. You get to travel all around the world, racing and training at some of the most famous and beautiful resorts. No two places are the same, and the constant change and unpredictability of the sport keeps everything really exciting. I don’t seem to appreciate it until I am home again, but it really is an amazing lifestyle to have. J – I have been lucky to meet some amazing people through the snowboarding scene many of whom I train with regularly and have become good friends. I have been able to travel and spend time in the mountains in different countries and experience different cultures. A special moment for me was last November at the London Freeze Festival when I was lucky enough to get the chance to ride in the international competition alongside some of the best riders in the world. Dropping in to a huge scaffolding big air jump in front of a home crowd of thousands was unforgettable and being asked to sign a little kids hat after topped it off! For the younger generation out there … what inspires you in the sport? J – I am most inspired by the people that I ride with. In freestyle, although there are many serious competitions, there is a general vibe of appreciation. Riders enjoy watching each others style, creativity and skill, pushing each other to progress. It is an exciting time for snowboarding as it is growing in so many different directions – everyone has their own way of snowboarding, there are few boundaries and that is why it never gets old. For the younger generation I would say snowboarding is a great sport that gives you freedom to express yourself and get out and enjoy the mountains on your doorstep. There is a really good community across the UK and wherever you choose to go snowboarding you will find people like you to ride with. C – I love ski racing, and skiing and everything about it, so for all the younger kids that enjoy skiing, it really is important to remember why you are still competing. There is always the desire to be the best, and win the most races and have the best ranking. But at the end of the day, I am still racing because I cant think of anything better that I would rather be doing and when you enjoy what you are doing, that is when you start to become a better racer, and the results will look after themselves. How do you see you in the future of the sport? C – I can definitely still see myself racing in 5-10 years time. I would love to be part of Team GB for the upcoming Sochi Winter Olympics, but I think they have come round 2 years to early for me. Qualifying for them is not impossible, but like everything, wont be easy. Therefore I 100% see myself at the 2018 Winter Olympic Games in Korea and will be working as hard as I can to make sure that I can fulfill my dreams and win World Cup and Olympic titles. Post racing, I still see myself involved in the sport coaching younger athletes, so that they too can learn to love Ski Racing as much as I do. J- I am excited for my future in snowboarding and I’m really looking forward to getting started with my training this season. I hope to continue my progression with the GB Freestyle Team and the 2018 Olympics is definitely a goal for the future. Snowboarding is my passion and forming a career as a professional athlete is something I really want to achieve. Whatever happens I will keep snowboarding for as long as I can! It’s clear to see that the slopes in and around the Cairngorms National Park have fueled Jamie and Charlie’s passions for their sports. So, this winter, with a little inspiration from two world class athletes and a landscape ripe for exploring on two skis or one board why not head to the hills and enjoy first class snowsports?